Decades from now, people on Earth may be gearing up for an unprecedented celestial spectacle — the intentional smashing of an asteroid into the moon. NASA is currently planning out an ambitious mission to snag a near-Earth asteroid and park it in a stable orbit around the moon, where it could be visited repeatedly by astronauts for scientific and exploration purposes. 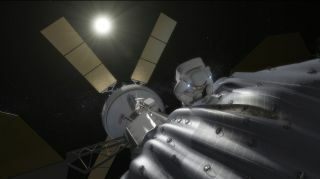 But the asteroid-capture mission may not end when astronauts leave the space rock for the last time. Seeing it through could require disposing of the asteroid in a safe — and possibly very dramatic — manner, experts say. "But if that's not enough, I think that, once you're finished with it and you have no further need of it, send it in to impact the moon," Chodas added. "That makes sense to me." NASA announced the asteroid-retrieval effort in April. The plan calls for a robotic spacecraft to rendezvous with a roughly 25-foot-wide (7.6 meters), 500-ton space rock and drag it to a stable lunar orbit. Alternatively, the probe could break a chunk off a larger asteroid; NASA is investigating both options. Either way, astronauts would then fly out to this transplanted rock using NASA's Orion capsule and Space Launch System mega-rocket (SLS), which are slated to fly crews together for the first time in 2021. The mission represents one way to achieve a major goal laid out by President Barack Obama, who in 2010 directed the space agency to get astronauts to a near-Earth asteroid by 2025, then on to the vicinity of Mars by the mid-2030s. Grabbing a space rock would also help develop asteroid-mining technology, reveal insights about the solar system's early days and give humanity critical experience working in deep space, NASA officials say. "It provides a tremendous target to develop our capabilities and operation techniques for our crews in the future as we go beyond low-Earth orbit," NASA human exploration chief Bill Gerstenmaier said during the panel discussion at Space 2013. Earlier this year, NASA asked the public and researchers in industry and academia to help them figure out how to pull off the asteroid-capture mission. The agency received more than 400 proposals in response, and it will discuss the top 100 or so during a workshop held Monday through Wednesday (Sept. 30 to Oct. 2) at the Lunar and Planetary Institute in Houston. You can watch a live stream of the workshop here on SPACE.com, courtesy of NASA TV. The asteroid's manmade lunar orbit should be stable for about a century, researchers say, so crews could continue flying out to the asteroid far into the future. Such visits may include both government-funded research and exploration flights as well as efforts undertaken by asteroid-mining firms or other commercial entities, NASA officials say. "We think we have a lot of options," Steve Stich, deputy director of engineering at NASA's Johnson Space Center in Houston, said during the Space 2013 panel. "We haven't really talked in detail about all those kinds of things that we can go do, but certainly we have enabled, by the way we have designed this mission, multiple visits to the asteroid." Once those visits are done, NASA may decide to bring the asteroid down, slamming it intentionally into the lunar surface. The agency has never done this with a space rock before, but it does have considerable experience de-orbiting moon probes that have reached the end of their operational lives. For example, the twin Grail spacecraft became part of the lunar landscape last December after wrapping up their mission to map the gravitational field of Earth's nearest neighbor.